While the Bureau of Land Management has a temporary hold on roundups for foaling season, they’re going to be back at it soon with roundups in California and Wyoming. As the BLM tells it, with no scientific proof, western rangelands can’t support the current number of horses and burros. They’d like us to believe they’re doing them a favor by running them down with helicopters, destroying herd dynamics and stockpiling the ones that don’t die during the roundup or transport into holding pens where they wait for death or what will most likely be a horrific end at a slaughterhouse. Despite public outcry, they continued with the last roundup at the Calico Complex in Nevada, which ended in February and brought in 1,922 horses, killed at least 86 of them and caused 40 mares to abort their foals. Foals born in holding facilities aren’t even counted. •	43 percent of deaths due to diet and metabolic failure, a condition related to the physiological changes induced by stress and trauma. •	22 percent of deaths due solely to “poor condition,” with a majority involving 20+ year old horses, raising humanitarian concerns about the ethics of stampeding elderly and ailing horses up to ten miles with helicopters before capture, separation from family and confinement. •	19 percent of the deaths due to traumatic injury either at the capture site or in the holding pens, including broken necks, spinal and pelvis injuries, fatal hoof and leg damage sustained in the helicopter stampede. 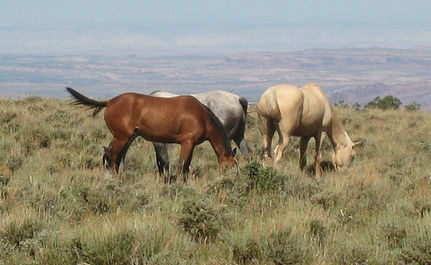 In addition to the inherent cruelty of the roundups themselves, advocates were also already suspicious of the BLM’s projected numbers and rationale behind saying half a million acres aren’t enough to support 2,000 horses when BLM memos turned up stating that the horses weren’t actually having that big of an impact on the land. The BLM also doesn’t like to mention that the federal government spends at least $144 million each year managing private livestock grazing on federal public lands, while collecting only $21 million in grazing fees, according to a 2005 report from the Government Accountability Office. That’s a net loss of about $123 million per year. Others estimate the cost to be as much as $500 million or more. All this for cattle that make up an estimated 3 percent of the nation’s beef supply. The BLM is on a mission to rid the west of wild horses and burros. They’ve made a mockery of the public comment process and will continue to mismanage our public lands while wasting millions of our dollars doing it. They’re about to get back to it with roundups planned for the White Mountain and Little Colorado Herd Management Areas in Wyoming and the Massacre Lakes Herd Management Area in California. Wild horse advocates are calling for a congressional investigation, public hearings and a moratorium on all roundups until a management plan that’s genetically, ethically and fiscally responsible, and works in conjunction with current laws, can be executed. Send letters opposing the latest plans to round up wild horses in California and Wyoming. Contact your representatives and senators asking them to support a moratorium on roundups pending a Congressional decision on a sustainable management plan. Sign the American Wild horse preservation Campaign’s petition on Care2. Visit the Wild Horse Preservation Campaign for more information. Terrible, thank you for caring. Despite OVERWHELMING public support these atrocities continue! Soulless bastards! What a legacy of EVIL, HATRED and CRUELTY they leave for their progeny. Probably don't care about them either. GREED has taken over. They are power junkies who will NEVER be satisfied! It's a sad time in this day and age when we as Americans who want to STOP this can not step-up and protect the American icon- wild horses. Why? The greedier Americans of this so-called heirarchy that have deep pockets and sit back in their offices all-the-while counting their scheckels could not give a horses tail whether the lives of these magnificent creatures are spared, because they are filling their greedy hands with blood money! Pathetic criminals.